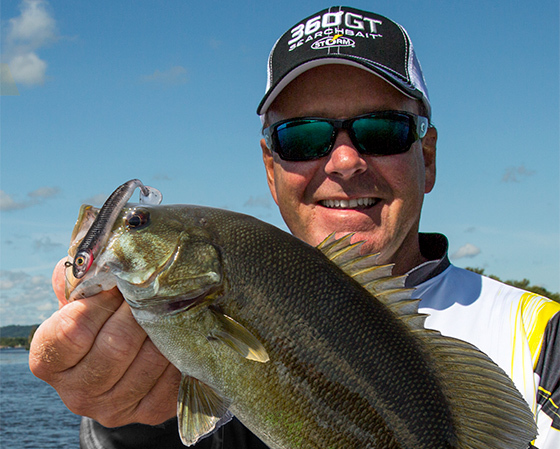 Anywhere and everywhere you see schools of baitfish this summer – shallow near the surface, or deep on your sonar graph – throw a Storm® 360GT Searchbait™ and you’ll put bass in the boat. “GT” stands for “Go To” bait. Creating the ultimate illusion of natural movement, the 360GT pairs a lifelike, single-ball rattling jig head with a realistic, phthalate-free soft body with 3D holographic eyes and a toe-in boot tail that elicits fish-attracting action and vibration at any retrieve speed. Like all professional anglers, Hite hits the water with several rods rigged with different baits to account for differing weather and water conditions. In the summer, one rod is always rigged with a 360GT. He picks it up when he sees schools of baitfish, be it 50 feet deep or a foot shallow. When baitfish are shallow, fishing a 360GT couldn’t be more simple – cast it out and reel it in. When your sonar graph shows schools of bait around deep structure like reefs, humps and rockpiles, just to name a few, you’ll need to count down your 360GT to the strikezone after casting toward your target. Hite’s summer 360GT game plan includes a “deep-shallow” strategy as well. When his sonar graph shows baitfish schooling near the surface over water 50 feet deep or more, he casts at the school and reels in rapidly, with his rod tip high in the 10- or 11-o’clock position. Smaller 360GT’s are generally better closer to the water surface, and vice versa to get to the bottom in deeper water. 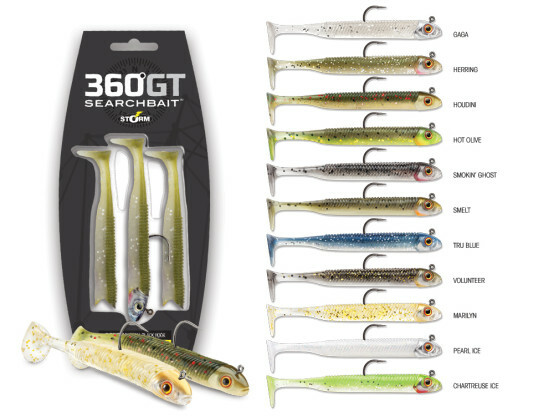 Pre-rigged 360GT’s are available in three sizes: 1/8 oz jighead, 3 1/2-inch body; ¼ oz. jighead, 4 ½-inch body; and 3/8 oz. jighead, 5 1/2-inch body. Each pre-rigged pairing comes in a package two extra bodies. Each size body is available in 11 color patterns: Chartreuse Ice, Gaga, Herring, Houdini, Hot Olive, Marilyn, Pearl Ice, Smokin’ Ghost, Smelt, Tru Blue and Volunteer. In most situations, Hite fishes 360GT’s on 12-pound-test fluorocarbon line with a 7-foot medium or medium-heavy baitcasting rod and a 7:1 ratio baitcasting reel. This entry was posted in Pro Staff, Storm. Bookmark the permalink. not used to using soft plastics, would love to try and get some pointers as well. I don’t use bait casting, strictly spinning reel.